Poptm.com another pop ads network which really push myself to write review about Poptm in my blog and I am sure there are many those are going to get help from this review, well there are even many. I know more than 500 publishers using pop ads networks for increasing there blog revenue, well there are few factors about Poptm those you can not ignore as a publishers, you will learn in this article. I know there are more than 95% readers of this blog are publishers even that's why I usually write reviews about advertisement networks. Up to 95% revenue shares- best in the market till now what I have heard about in last five years. About Poptm Pop Under Ad Networks? 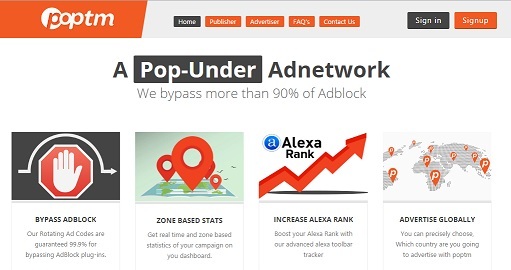 This is a pop under pop ads networks & of course you will find out many ad networks in this space but there are couple of things which stand this network better than others, the most important thing I like about this network is up to 95% revenue sharing, which is really cool for publishers to earn more money from ad networks. One of the best thing I wonder about this ads network that is growth graph, if you will look at alexa ranking growth graph then I must say its awesome, here is the screen shot of it, the screen shot is old if you will see the recent growth or I must add recent stats of this ad network then you will definitely in dilemma, that how any ad network can grow so fast. 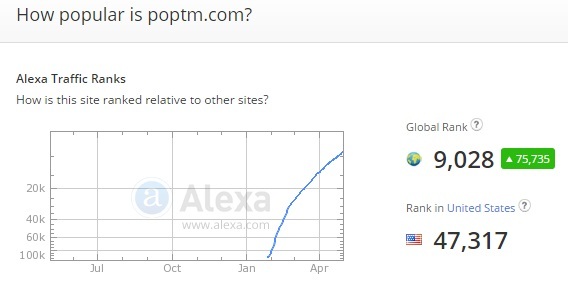 Here, poptm team done wonderful job and they have grown so fast, because as right now I am writing about them their alexa rank is world wide 369. Is not that amazing, yeah I would like to listen to you about this fact because this is just superb, now you can understand if any ad network grow so fast what does that mean? 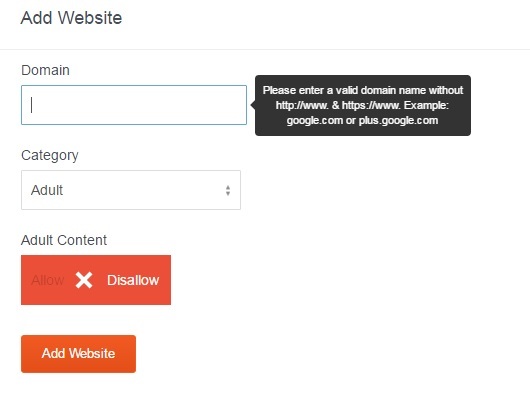 I am sure you are one of the publisher and may be you are looking for an ad network which can take good care of you for making money from your blog so here with poptm you can get it like others are getting from it. Lowest rank country is Indonesia that is 505- that means in Indonesia Poptm is most popular. You can get payment through Paypal, which I have been using from last five years to get paid from different ad networks. 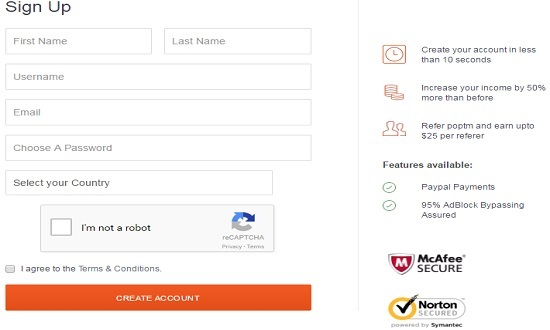 Now after browsing the website you need to click on Sign Up, this option is available right there only. 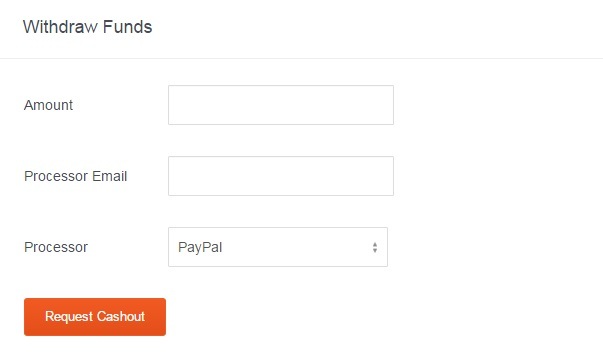 As soon as you will reach you will be able to withdraw your money to your Paypal account and then directly to your bank account as simple as that, if you still don't have Paypal account then create one and get verified. Then you will see options to choose for cash out, here is the screen shot of it. and then click on Request cash out, that's it now they will pay you within 24 to 48 hours most of the time but sometimes it may take up to a week. CPM networks always pay good, you can not doubt on it, because there payment is not depend on per click it is depend on per views, so that's why it is always helpful for bloggers to increase their earning. 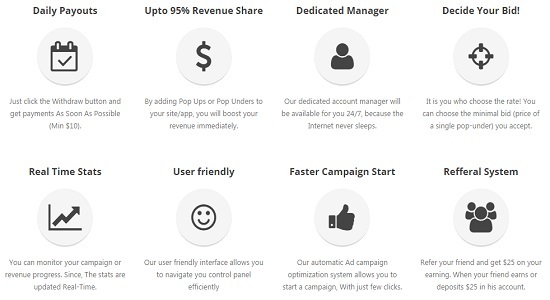 As I have shared with you Poptm is up to 95% revenue sharing networks that means automatically your revenue will increase, so this is your opportunity to take the right step and see the growth in revenue. Yes, this is the reason I have written this review for all, I hope Poptm will work great for even small publishers.